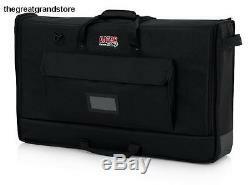 Cases Padded Nylon Carry Tote Bag for Transporting LCD Screens Monitors Foam Tvs. The Gator Cases G-LCD-TOTE series bags are the ideal solution for toting LCD, LED, or OLED TVs and monitors. The LCD, LED, or OLED tote by Gator Cases protects the TV or monitor with 25mm of foam padding on all sides, top, and bottom. The interior side wall also includes a sheet of polyethylene to protect the screen of the monitor or TV during transport. The interior is lined with a soft tricot material to protect the TV or monitor screen from scratches and scuffs. The exterior of this durable, protective flat screen tote bag also sports awesome features such as a dual zipper design, durable nylon web carry handles, adjustable shoulder strap, and a generously sized storage pocket for cables, keyboard, and other accessories. The G-LCD-TOTE case by Gator Cases is the perfect solution for transporting gaming monitors, flat screen TVs and monitors for tradeshows, DJ visual display screens, and other applications requiring the transport of LED, LCD, or OLED flat panel TVs, monitors, or displays. The G-LCD-TOTE-MD, medium LCD, LED, and OLED TV or monitor transport tote bag fits screens between 27 and 32. The interior dimensions are: Interior Length: 30.4 Interior Width: 18.5 Interior Height: 3.2 and fits popular models of LCD, LED, or OLED screens by manufacturers such as Samsung, ASUS, BenQ, LG Electronics, Acer, Dell, Sony, and many others. To insure that you have chosen the correct size for your TV or monitor, please compare the interior dimensions provided above with the dimensions of your TV or monitor. Gator Cases is known for manufacturing innovative products designed to protect! We offer a wide range of products with a variety of available sizes, materials, and protection levels, for all types of instruments and gear including Frameworks stands, Rackworks install racks and accessories, and Protechtor drum cases. It isnt hard to find a great reason why Gator should be the brand you trust to protect your equipment for life! Gator Cases Padded Nylon Carry Tote Bag for Transporting LCD Screens, Monitors and TVs Between 27" - 32" (G-LCD-TOTE-MD), Fits Screens Between 27" - 32", Heavy-Duty Nylon Construction, 25mm PE Foam Padding on All Sides to Protect Screen During Transport, Polyethylene Reinforced Front Provides Additional Protection for Screen, Great for use at Tradeshows, Tailgates, Conventions, Live Events, DJ/Karaoke, PC Gaming, & More. The item "Cases Padded Nylon Carry Tote Bag for Transporting LCD Screens Monitors Foam Tvs" is in sale since Sunday, August 27, 2017. This item is in the category "Musical Instruments & Gear\Pro Audio Equipment\Cases, Racks & Bags". The seller is "djnds_onlineseller" and is located in Seattle, Washington, 98101. This item can be shipped to United States.